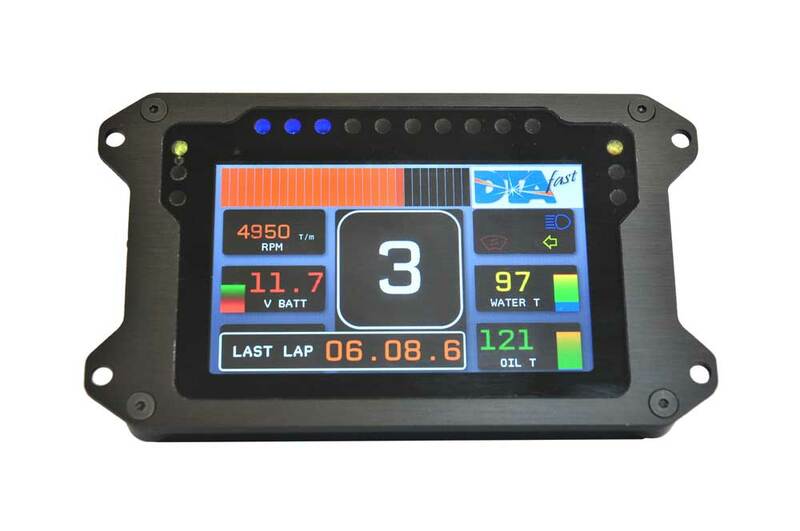 The new DTA NT-Dash is a powerful full colour digital dashboard for use at all levels of motorsport.A 5.0” TFT colour display with 800 x 480 pixel resolution, and built in ambient light sensor, ensures perfect readability in all environments. The NT-Dash is available in various configurations. Fully customisable dashboard ready to work with any DTA S series ECU. Built in 20Hz GPS with external antennae and accelerometers to track location and G forces. 4 Gigabytes of on board logging at up to 1kHz. Includes logging of all data on the CAN BUS, as well as the ability to log any analogue and digital sensors connected directly to the dash. 37 Pin autosport connector – £90. Required for additional analogue and digital inputs only. Upgrade Option 1 or Option 2 dash to include logging – £140. A BRIGHT 5’’ TFT DISPLAY – perfect readability in all environments.